"My inspiration comes from a place so deep within that the only way to express it is through art." Raheem Saladeen Johnson is a self taught artist born and raised in West Philadelphia. His passion for art began prior to attending kindergarten when he would create drawings for his mother and the walls in his room. With limited outlets for art, graffiti and murals were the applications that existed in the inner city. Sports, especially basketball became a constructive activity and one that Raheem excelled in. Raheem attended University City High School and prep school at International Christian where he would score over 1000 points. Basketball provided the opportunity to travel across the U.S. while playing for elite AAU teams. Raheem would often daydream about colors and designs while being exposed to different landscapes and influences. An auto accident at the age of 15 sidelined basketball for months, but re-ignited the creative flame as sketching was something that he could do while recuperating. Once healthy, Raheem earned a scholarship to an esteemed Junior College in preparation for a Division 1 NCAA scholoarship. Less than two years into his collegiate career, Raheem decided to put the basketball down because the paintbrush was calling him. His return to Philadelphia would lead to him working as a design artist with a local clothing company who grew into a national success during his tenure. The clothing company was ultimately sold which led to a career change. Raheem began working at a juvenile detention facility for teenagers in Philadelphia. Creating sketches and paintings served as stress relief for Raheem, but also became a source for hope for teenagers in otherwie unpleasant situations. Raheem's best friend John "JP" Thompson bought him his first set of professional art supplies and would ultimately influence him to quit his job in pursuit of art full time. July 4th, 2011 was Independence Day as Raheem walked out of his job and ventured into Salaldeen Art Group. JP unexpectedly passed away from brain cancer in 2013 and remains a constant source of inspiration. 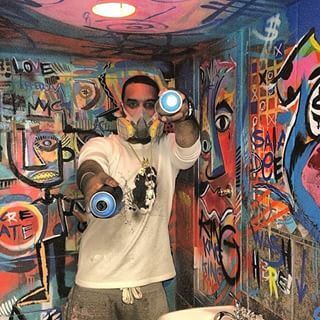 With 100% of his time and energy focused on creating, Raheem began presenting his artwork in New York City, Los Angeles and Miami. King Saladeen's first solo art show was held in Hollywood and followed up by showcasing and live murals at Art Basel 2013. The momentum of 2013 has led to Raheem working with art galleries, interior designers, high end auto collectors and fashion companies.